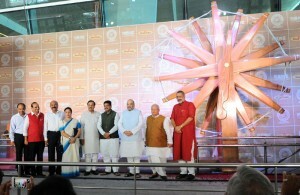 World’s largest Charkha (spinning wheels) unveiled on Tuesday by Shri Kalraj Mishra, Union Minister for MSME at the Terminal 3 of IGI Airport Delhi. Installation of the iconic Charkha at the departure forecourt would carry forward the legacy of promoting India’s rich cultural heritage through different artworks at the terminal. All the existing art works at the terminal – Mudras, Regal procession, Elephant statues, Surya Sculpture, Suryanamaskar and Worli Art among others – depict and showcase Indian heritage globally. Prime Minister, Shri Narendra Modi in a message for this occasion said “The Charkha is a symbol of our glorious heritage, and an inspiring reminder of our freedom struggle, led by the father of the Nation- Mahatma Gandhi”. The Minister of State for Petroleum and Natural Gas (Independent Charge), Shri Dharmendra Pradhan, BJP President Amit Shah, Minister of State for Culture (Independent Charge), Tourism (Independent Charge) and Civil Aviation, Dr. Mahesh Sharma, the Minister of State for Micro, Small & Medium Enterprises, Shri Giriraj Singh and other dignitaries are also present on this occasion.